Another beautiful day out on the water, whether inshore or offshore it was beautiful. 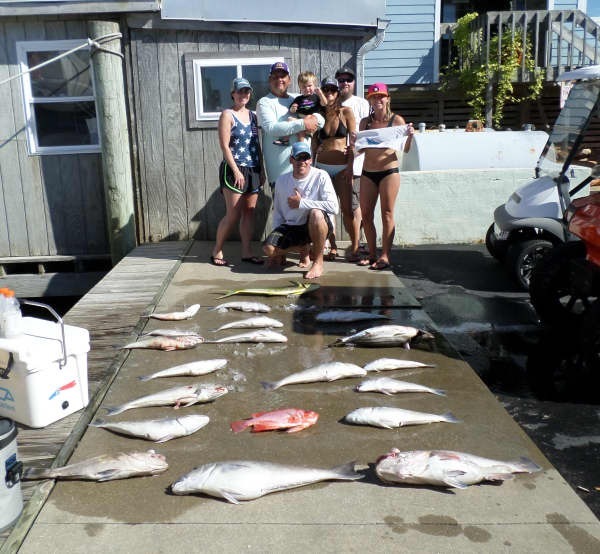 Inshore anglers had a great day catching Bluefish, keeper Red Drum, keeper Cobia and Clams. 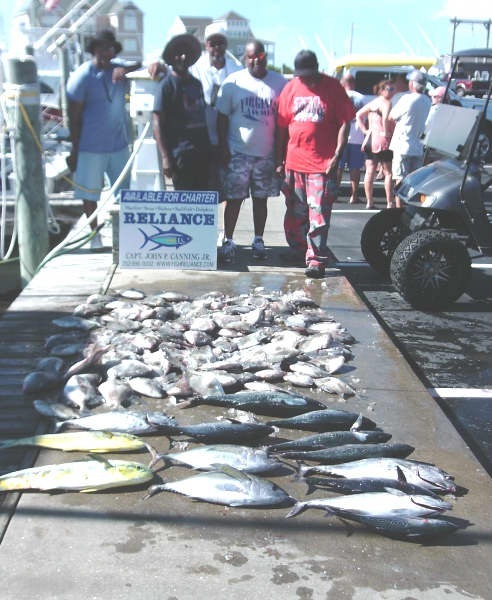 Offshore fishermen had good catches of Dolphin, a few Wahoo and a few Blackfin Tuna. Good Times released a Sailfish. Some bottom fish were also caught. A few Black Tip Sharks were released. More blue skies and very hot temps. 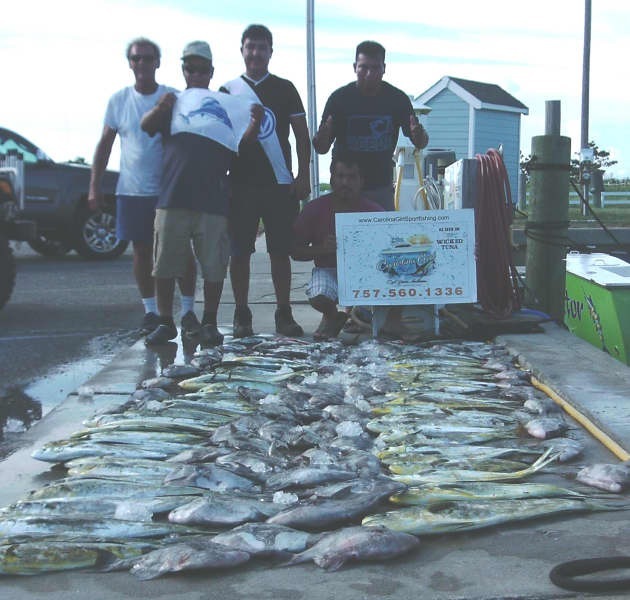 Offshore fishing was on the slower side with good Dolphin catches and a few Blackfin Tuna. Sailfish made a showing today with Hatteras Blue releasing 2 and Sea Creature releasing 1. There were also Sea Bass and Triggerfish being caught. Inshore large schools of Red Drum were wearing our anglers out. Bluefish continue to be thick as well. Hatteras Blue: Katherine Fox of Chicago, IL released a Sailfish. James Eiswerth of West Hollywood, CA released a Sailfish. Gina Holden of West Hollywood, CA caught a 21lb Blackfin Tuna. Sea Creature: Berrett Brand of Asheville, NC released a Sailfish. Tightline: Kevin Oakes of Virginia Beach, VA released 2 Red Drum. Debra Oakes of Virginia Beach, VA released 2 Red Drum. Blue Marlin were on the prowl today with only a few boats out lots were seen. Release and Reliance both released Blue Marlins today with several more being seen. 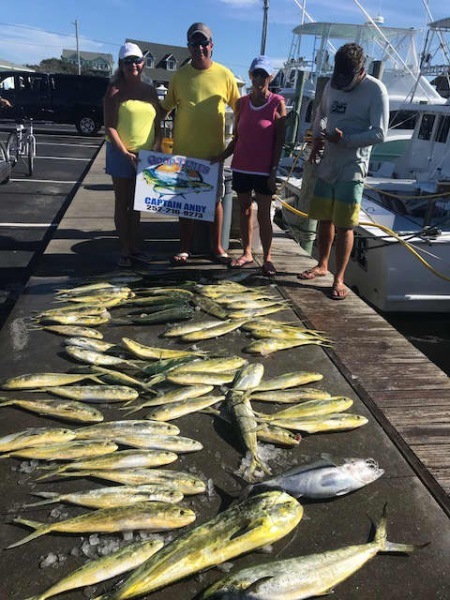 There were good catches of Dolphin with some boats catching limits. 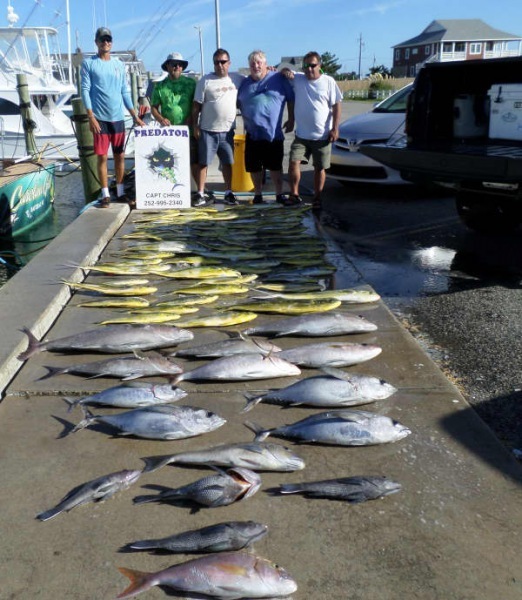 There were also a few Blackfin Tuna and Amberjack and Sea Bass. Inshore boats were finding large schools of Bluefish and a few Red Drum. Reliance: Mason Lynn of Broadway, VA released a Barracuda. Todd Lynn of Broadway, VA released a Blue Marlin. Release: Charles Simmers of Ruther Glen, VA released a Blue Marlin. Summer might be winding down but it certainly didn't look that way in Hatteras today. Blue skies calm seas and some HOT weather were the forecast today. 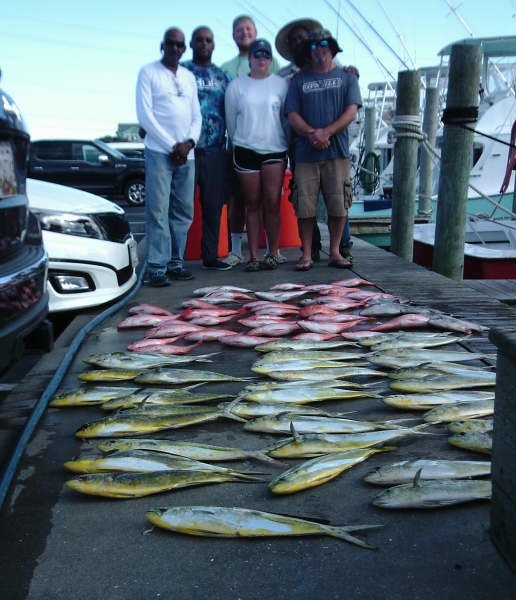 Offshore boats had excellent catches of Dolphin with some boats catching limits. There were a few Triggerfish and Snapper mixed in. Inshore boats were skimming along some mirror waters and catching excellent Red Drum and Bluefish. What a beautiful day to begin the month of September! Anglers took advantage of the weather to get out onto the water. 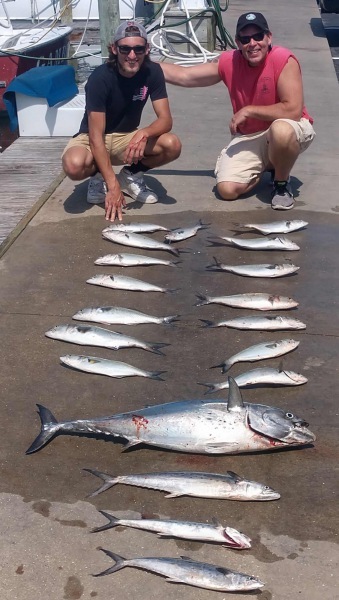 Inshore anglers continue to experience a good Bluefish bite. They got on some Red Drum this afternoon. Clamming was a real treat as they got to get wet as they dug in the sand flats. 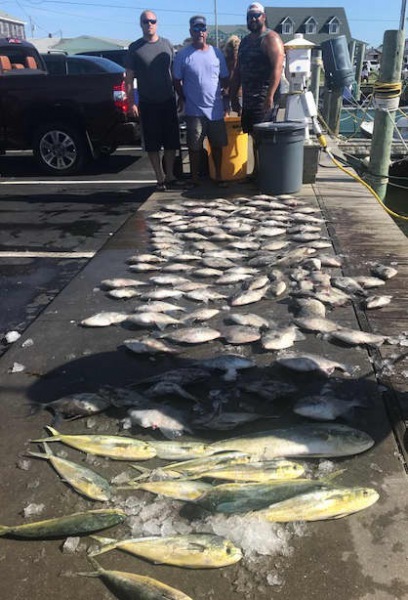 The Dolphin bite was on offshore and some parties returned with limits. The Blackfin Tuna bite picked up a bit today. Bottom fishing was good with Triggerfish, Vermillion Snapper, Silver Snapper, and Black Sea Bass. 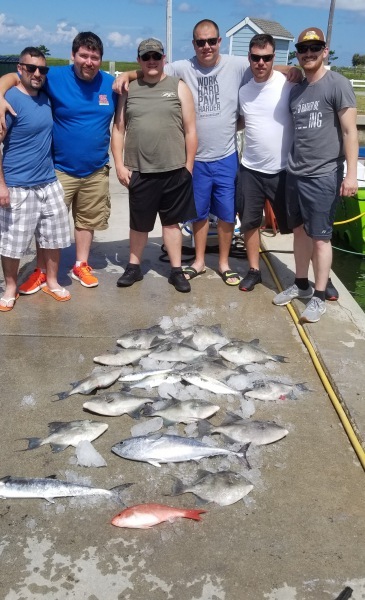 The weather should hold out for the long weekend - don't miss out - give us a call at 800-676-4939 to book your fishing excursion. Dean Dunn of Goochland, VA: Barracuda release on Lucky Chip. Austin Guill of Appomattox, VA: 82" Shark release on Predator. Robert Crowder of Madison Heights, VA: 82" Shark release on Predator. Landon Rothgeb of Bedford, VA: 89" Shark release on Predator. 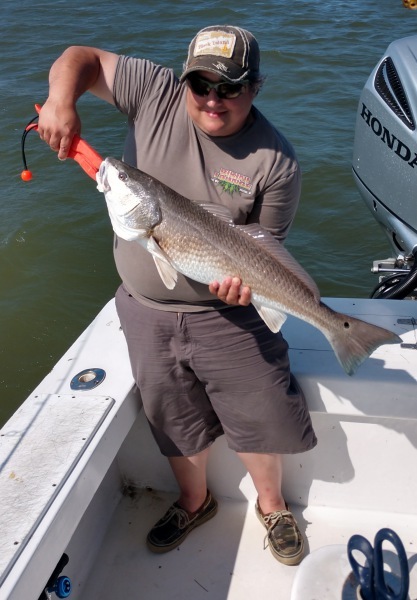 Antonio Tartaglia of Philadelphia, PA: 46" Red Drum release on Sound Bound. 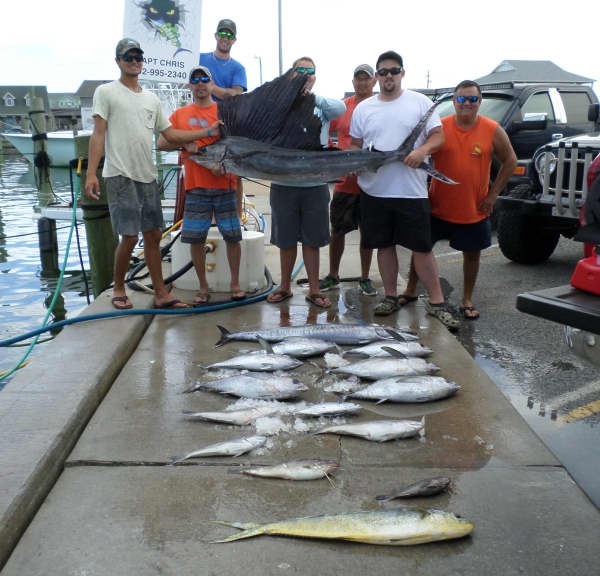 Juan Diaz of Elizabeth City, NC: Sailfish release on Carolina Girl. It's hard to believe that August has come and gone. The heat index today was extremely high and the best place to be was in the water. 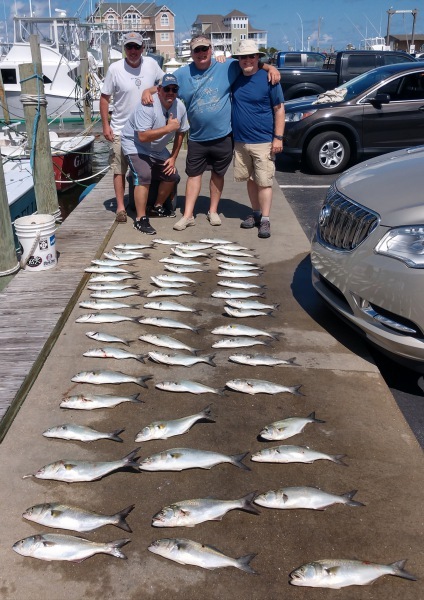 Inshore anglers enjoyed a good Bluefish bite this morning and even returned with a Black Sea Bass caught in the Pamlico Sound. Afternoon anglers got on Red Drum (releases). 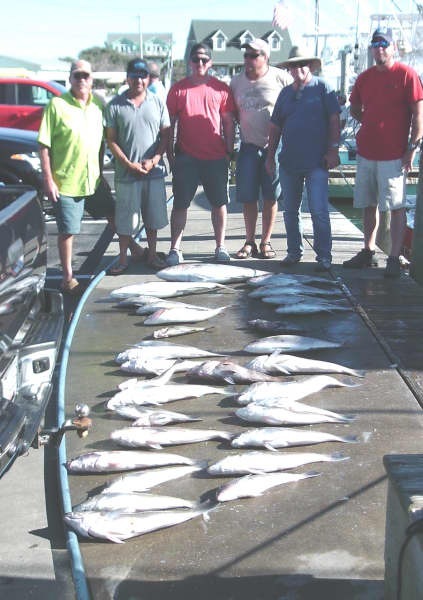 Our offshore captains reported spectacular fishing, but catching was another story. There was a fair Wahoo bite, along with a few Dolphin and Blackfin Tuna. Bottom fishing was good with Triggerfish, Grouper, and Gray Trout. One Sailfish was released. Have a safe weekend! Ethan Schrim of Pittsburgh, PA: 52 lb. Grouper on Good Times. Charlie Spohn of Sarver, PA: 10 lb. Gray Tilefish on Good Times. Nicole Garvey of New York, NY: Sailfish release on Native Son. Summer came back today with extremely hot temperatures along with pretty calm conditions. Inshore parties caught lots of Bluefish this morning along with over the slot Red Drum. They got on some keeper Drum this afternoon. 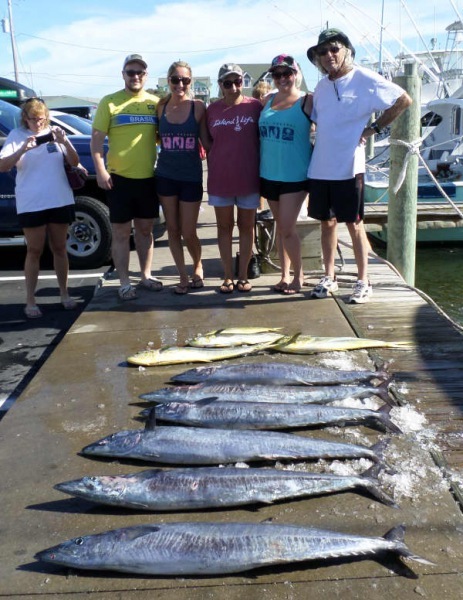 Several parties ventured offshore and brought back a couple Wahoo, a few Dolphin, and a few Blackfin Tuna. 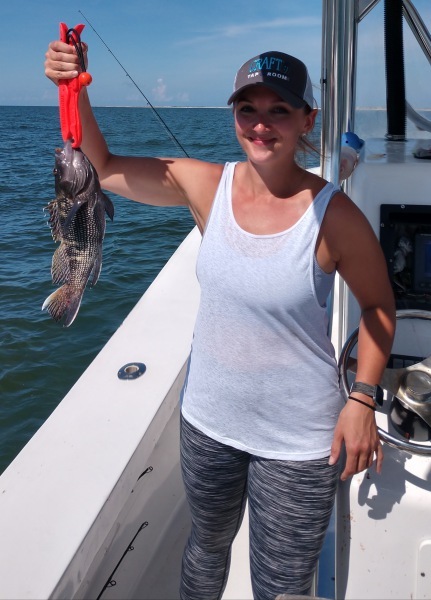 Bottom fishing was good with Triggerfish and Black Sea Bass. 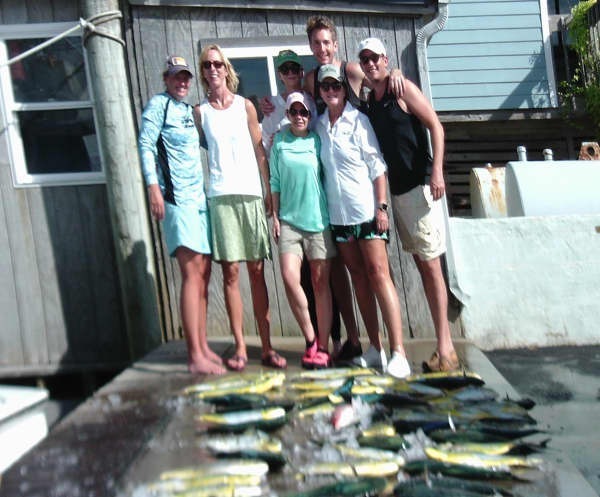 We offer inshore, near shore, and offshore fishing trips. We also offer Make up charters for offshore trips. 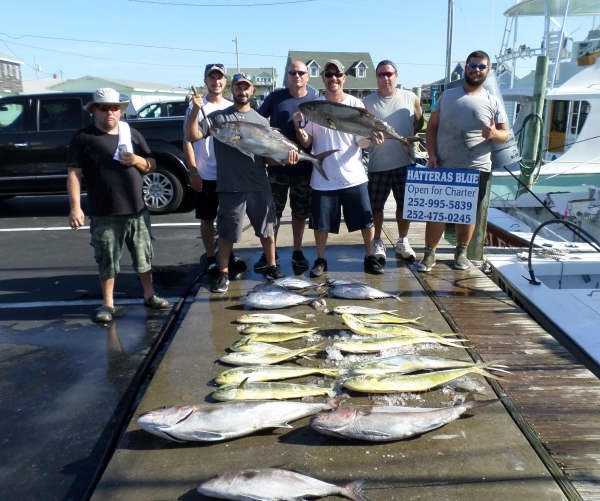 Give us a call at 800-676-4939 to book the fishing venture of your choice. 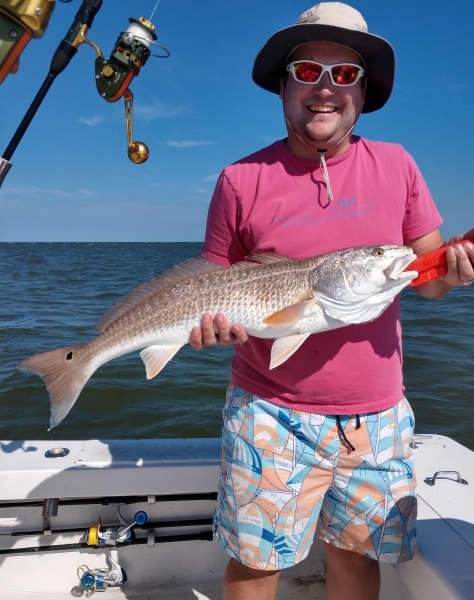 Kyle Sloan of Chesterfield, VA; 48" Red Drum release on Tradition. Carter Sloan of Chesterfield, VA: 48" Red Drum release on Tradition. Another beautiful day on Hatteras Island. Temperatures in the 90's, little wind, and good fishing made anglers quite happy today! 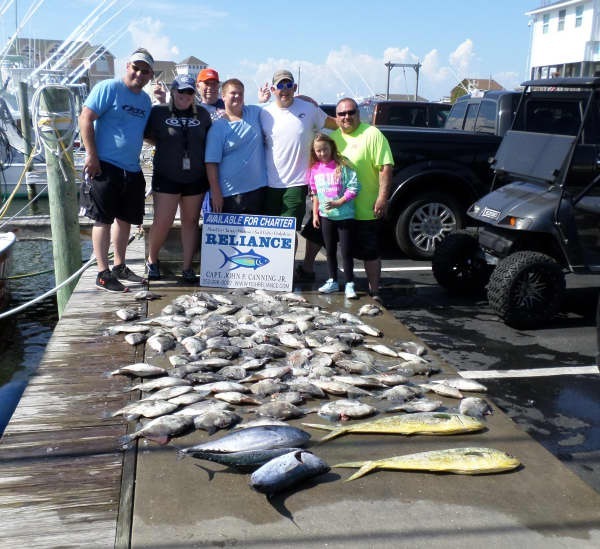 Inshore anglers fished the Pamlico Sound and returned with good catches of Bluefish and Spanish Mackerel. There was good Red Drum action this afternoon. 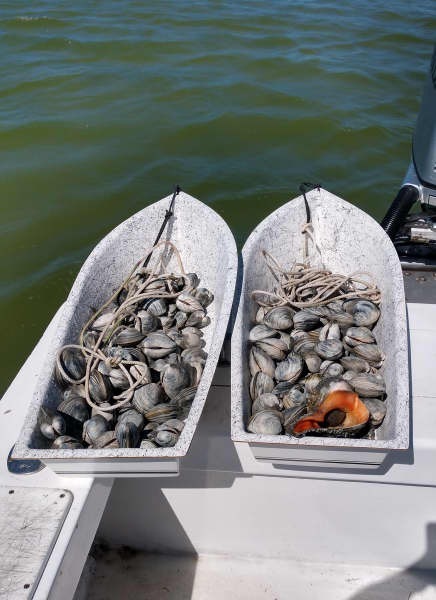 It was a great day to be in the water and several groups enjoyed clamming. Sounds like a wonderful meal on the grill tonight! It was a beautiful day offshore. Fishing improved with good catches of Wahoo, along with some Blackfin Tuna.Dolphin fishing was fair. 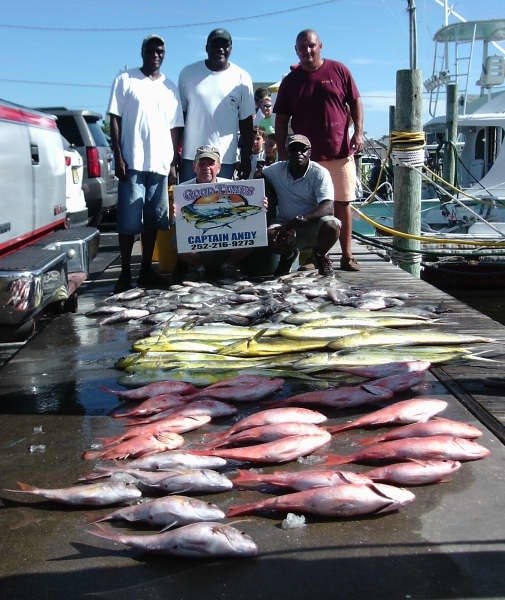 Bottom fishing produced Triggerfish, Vermillion Snapper, Grouper, and Tilefish. One Blue Marlin was released. We need three people for a Make up charter for Thursday or Friday. Call 800-676-4939 if interested. Charidy Anders of Frisco, NC: Blue Marlin release on Sea Creature. Dennis Robinson of Hatteras, NC: 11 lb. Gray Tilefish on Sea Creature. 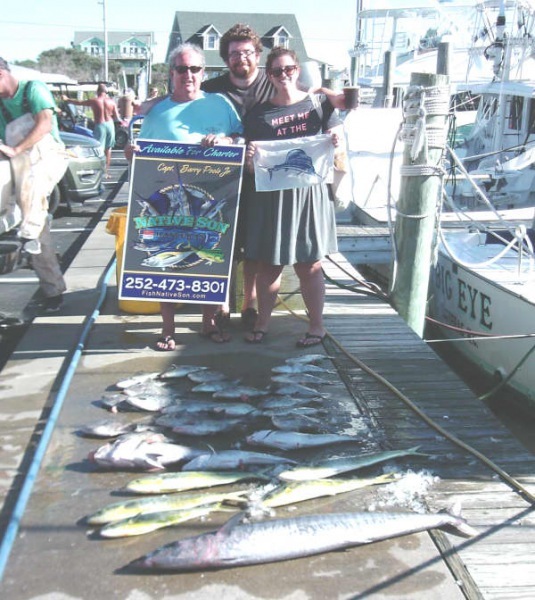 Great weather Offshore with fair catches of Wahoo and Dolphin. 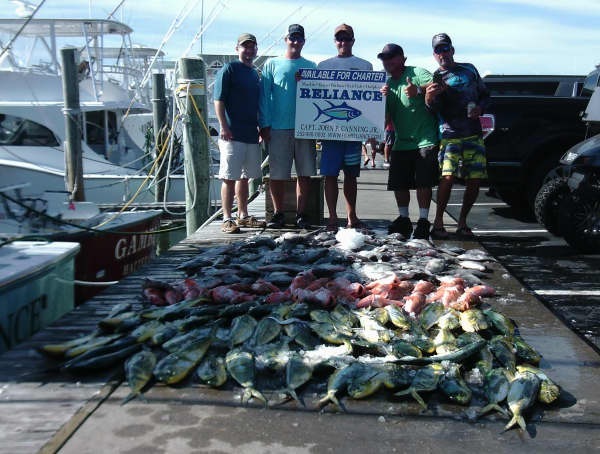 Reliance caught a Sailfish. 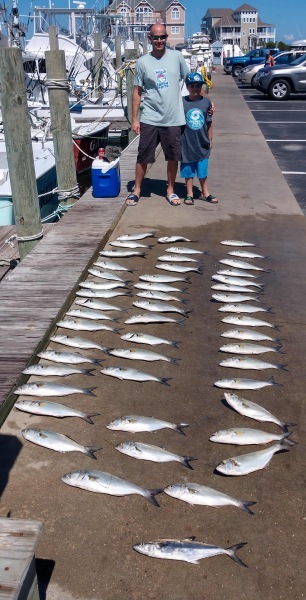 Inshore boats found good Bluefish, Spanish Mackerel and keeper size Red Drum. 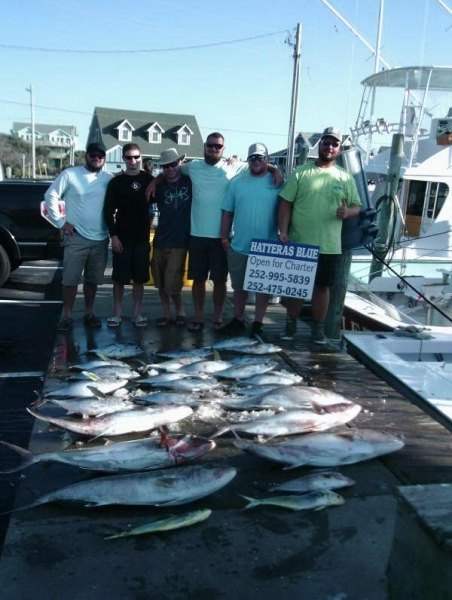 Nearshore boats were catching King Mackerel, Albacore and Triggerfish. Great weather continues with both Inshore and Offshore Captains loving it. Offshore today Dolphin really picked up for some boats as well as a good Wahoo bite. 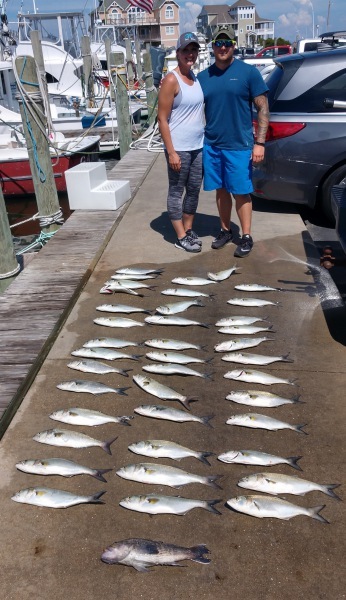 There were a few Blackfin Tuna as well and good bottom fishing with Triggerfish and Grouper. A good size Cobia was brought in as well as an unusual catch of a Moray Eel. 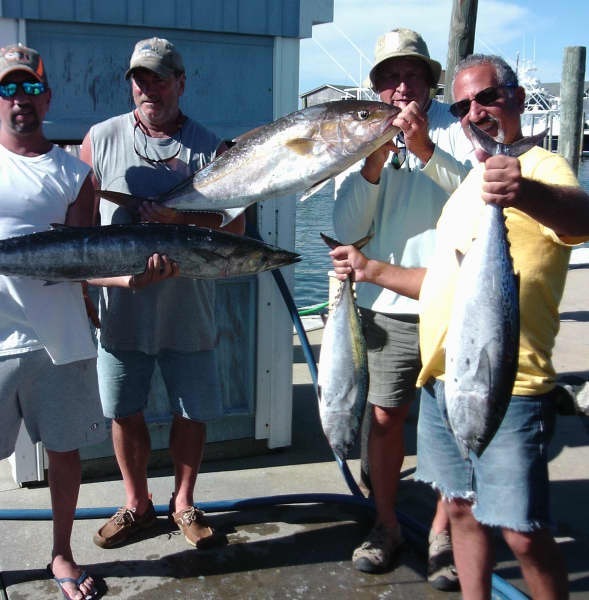 Inshore boats were catching Spanish Mackerel, Bluefish and Albacore. Predator: Nikki Sturgill of Whiteford, MD caught a 50lb Wahoo. Joshua Sturgill of Whiteford, MD caught a 25lb Grouper. Hatteras Fever: Michael Greene of Waynesville, NC caught a 45lb Wahoo.